The decline in antibiotic effectiveness/ the increase in bacterial resistance. (Medical Xpress)—The chief medical officer for Britain’s Department of Health has issued a warning that resistance to bacteria is a more urgent threat to humanity than global warming, with bacteria becoming resistant to current antibiotics at an alarming rate, and there are almost no new antibiotics in the pipeline. Professor Dame Sally Davies spoke to British members of parliament on a science and technology committee and told them the increasing resistance of bacteria could soon make even a routine operation a deadly option because of the possibility of an infection that would have no effective treatment. She said that the real “apocalyptic scenario” was that within a couple of decades people will die from infections because we will have “run out of antibiotics” and there are no wonder drugs in the pipeline. She added that it is a serious global problem and antibiotics are not being used effectively. The development of antibiotics in the 1940s was one of the greatest advances in medicine, but they are becoming increasingly ineffective as bacteria become resistant to them. • Prof. Davies said there is only one effective antibiotic left for gonorrhea and 80% of cases are resistant to tetracycline. • Tuberculosis is becoming increasingly resistant and there are around 150,000 deaths globally from multi-antibiotic resistant tuberculosis each year. • MRSA (methicillin-resistant staphylococcus aureus) is increasingly prevalent, especially in health care facilities. Prof. Davies said there is “a broken market model” for the development of new antibiotics, which means there could be no new antibiotics in the future. The pharmaceutical industry is concentrating its efforts on more profitable treatments such as drugs for chronic diseases, which has led to a reduction in research aiming to find or develop new antibiotics. The World Health Organization has also warned of a coming post-antibiotic era in which common ailments cured by antibiotics will once again be fatal. Director-General Margaret Chan said a post-antibiotic era would mean even a common scratch or a strep throat could again lead to uncurable infections and death. In March, Prof. Davies will be releasing her annual report, which will include strategies to solve this global problem. She said it was a serious issue that needs to be tackled urgently, and will be asking the Cabinet Office to add it to the national risk register. She also urged doctors to be more cautious about how they prescribe antibiotics and patients to be more responsible in taking them (by taking the entire course when antibiotics are prescribed). 18 Sep. 2008, ScienceDaily.com, The following news story is reprinted from materials provided by BMJ-British Medical Journal, via EurekAlert!, a service of AAAS. Vital components of modern medicine such as major surgery, organ transplantation, and cancer chemotherapy will be threatened if antibiotic resistance is not tackled urgently, warn experts on bmj.com. A concerted global response is needed to address rising rates of bacterial resistance caused by the use and abuse of antibiotics or “we will return to the pre-antibiotic era”, write Professor Otto Cars and colleagues in an editorial. All antibiotic use “uses up” some of the effectiveness of that antibiotic, diminishing the ability to use it in the future, write the authors, and antibiotics can no longer be considered as a renewable source. They point out that existing antibiotics are losing their effect at an alarming pace, while the development of new antibiotics is declining. More than a dozen new classes of antibiotics were developed between 1930 and 1970, but only two new classes have been developed since then. According to the European Centre for Disease Prevention and Control, the most important disease threat in Europe is from micro-organisms that have become resistant to antibiotics. As far back as 2000, the World Health Organisation was calling for a massive effort to address the problem of antimicrobial resistance to prevent the “health catastrophe of tomorrow”. So why has so little been done to address the problem of resistance, ask the authors? Antibiotics are over prescribed, still illegally sold over the counter in some EU countries, and self medication with leftover medicines is commonplace. There are alarming reports about serious consequences of antibiotic resistance from all around the world. However, there is still a dearth of data on the magnitude and burden of antibiotic resistance, or its economic impact on individuals, health care, and society. This, they suggest, may explain why there has been little response to this public health threat from politicians, public health workers, and consumers. In addition, there are significant scientific challenges but few incentives to developing new antibiotics, state the authors. The authors believe that priority must be given to the most urgently needed antibiotics and incentives given for developing antibacterials with new mechanisms of action. In addition, “the use of new antibiotics must be safeguarded by regulations and practices that ensure rational use, to avoid repeating the mistakes we have made by overusing the old ones”, they say. They point out that reducing consumer demand could be the strongest force to driving change—individuals must be educated to understand that their choice to use an antibiotic will affect the possibility of effectively treating bacterial infections in other people. But, they claim, the ultimate responsibility for coordination and resources rests with national governments, WHO and other international stakeholders. Not only is there an urgent need for up-to-date information on the level of antibiotic resistance, but also for evidence of effective interventions for the prevention and control of antibiotic resistance at national and local levels, while more focus is needed on infectious diseases, they conclude. 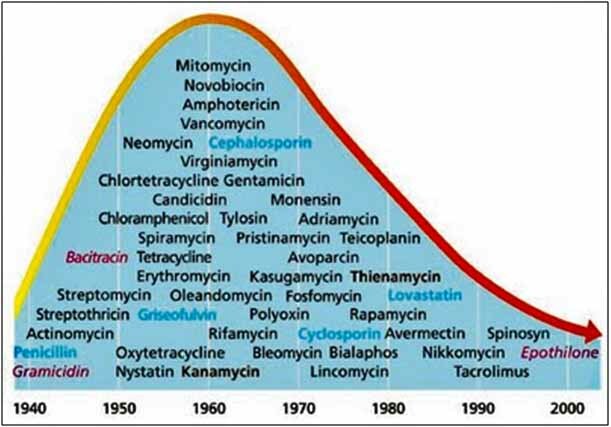 [The above chart is interesting, it shows the past; however, for the last 30 years, new classes of antibiotics have declined to 17% of their 1983 number. Infectious disease has been significantly reduced since 1900. Be aware: Bacteria can double their population size in 20 minutes. As soon as pressure is reduced from the black box of disease control, this reproductive genie will pop out and within a few years eliminate the Maginot Line we built during the heyday of modern antibiotics. 1. As you can see from the chart at the top of this post there is a rapid decline in antibiotic effectiveness, or put another way, an increase in bacterial resistance to the antibiotics. 2. 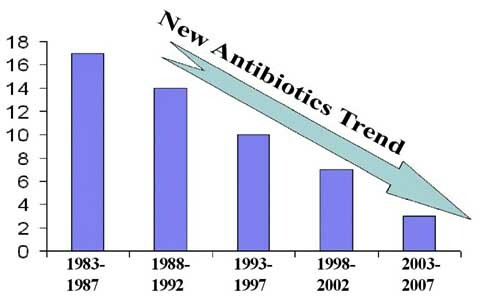 The chart immediately above shows a huge 83% decline in the development of new antibiotics. 3. 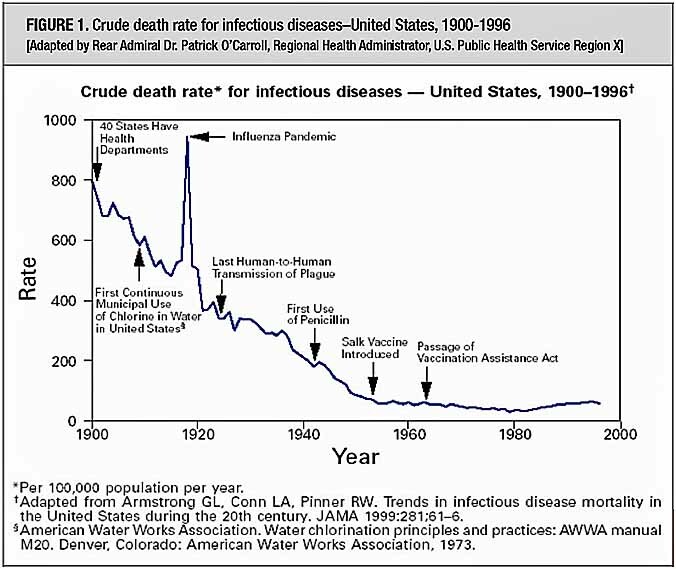 The middle chart: Crude Death Rate for Infectious diseases shows the decline in death rate from infectious diseases between 1900 and about 1995. The rate declined steadily with each new disease that was “conquered” by the new classes of antibiotics. __a) Modern life styles, promiscuity and the belief that medicine will always heal your ailments are prevalent, allowing individuals to engage in a wide range of sports, sexual, and drug related activities that are risky. __b) Super microbes will increasingly kill their host and develop deeper entrenchment in the very medical facilities – places where people go for healing. __c) Designer microbes or virus (killer flu, etc.) will eventually get out of the lab or be used from a stockpile. A genie that is once exposed to the “wild” may never go back in the bottle.